We have contracted with Gilmore Services to provide a shredding truck and operator. Anyone may bring 50 lbs. of household documents to be shredded. No business may participate. Just drive up to the truck and your documents will be unloaded and shredded. We will once again host another community yard sale called ‘Junque in Your Trunque’. All sellers must register in advance and we can accommodate up to 50 sellers. The cost to have a table is $20 for non-members and free to paid members of PBA. Anyone interested in selling may register online at the Pensacola Beach Advocates' website (pbadvocates.org) and pay with Pay Pal. Register as a Seller to register online and pay with Paypal. Applications are also availbale at the Pensacola Beach Visitor's Center or the Island Times Newspaper. Once completed, the application can be dropped off at the Visitor's Center or mailed to PBA, PO Box 1261, Gulf Breeze, Florida, 32562. You MUST complete and submit an application to sell. At ‘Junque in Your Trunque,’ you may sell household items; no retail, arts/crafts, consumables, plants, animals or hazardous material. All items sold must be allowed by law. Additionally, we would like to expand the items to be sold to include surf boards, paddleboards, wet suits and others items used to enjoy the beach. Each seller will be assigned a parking space where you will pull in your vehicle and sell your items from the rear of your vehicle. Bring a table to display your items. If you plan to bring a trailer you must advise us in advance. Goodwill Easter Seals will be on site for anyone wishing to make donations, whether or not you are a seller in the Yard Sale. For sellers, they will take items you do not sell if you would like to donate them. They accept all household items, clothing, toys, as well as computers and related electronic, small household appliances such as irons, toaster ovens, microwaves and TVs. An attendant will be on hand to receive the items and issue receipts. Pensacola Beach. Artwork from the Pensacola Beach Elementary School Art Contest will be on display. 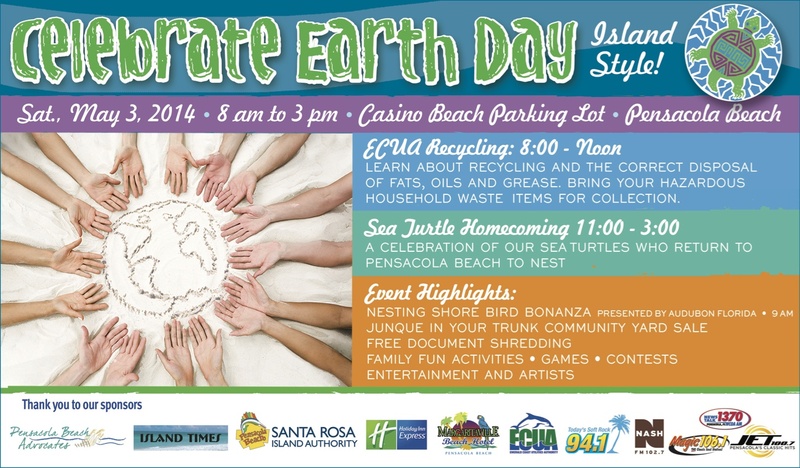 From 11:00 am until 3:00pm we are hosting a Sea Turtle Homecoming on the stage at Casino Beach Stage. This is a celebration of our sea turtles who return to nest. This is a fun, educational event to increase awareness of how we can coexist with these amazing visitors and still enjoy our beach. There will be family fun activities, games and contests, and information for children and adults. From 9:00 am to Noon at the Gulf Side Pavilion we will have information and kids' activiites regarding nesting shore birds, presented by Audubon Florida.